Type 2 diabetes mellitus (T2DM) which accounts for more than 95% of all diabetes cases is a heterogeneous, multifactorial disorder typified by hyperglycemia with gradual decline in insulin action (insulin resistance), followed by the inability of beta (β)-cells to compensate for insulin resistance (pancreatic β-cell dysfunction). Subsequently in due course, T2DM often brings about severe complications of macrovascular and microvascular origin. This alarming scenario has fostered research into the development of novel pharmacologic agents for the treatment of T2DM, as well as evaluation of the safety and efficacy of old as well as new anti-diabetic medication. Animal models mimicking human T2DM are pivotal for the biological screening of anti-diabetic drugs, and several approaches have been used to develop such models. These include genetic manipulation such as the ob/ob mouse, db/db mouse, Zucker fa/fa rat etc and various treatment regimens with one or more chemicals such as alloxan, streptozotocin etc. Regardless of such animal models, available for T2DM, most of them fail to successfully simulate the characteristics of human type 2 diabetes mellitus (T2DM), are not easily available and tend to be expensive. 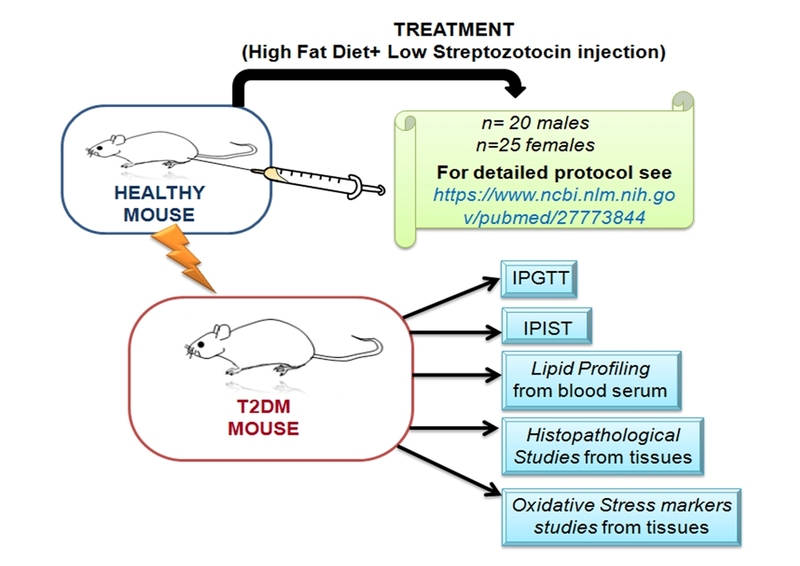 In this manuscript we report the development of a mouse model of T2DM through a combination of feeding with an inexpensive high-fat diet combined with multiple low-doses of the cytotoxin streptozotocin (STZ), which causes a mild impairment of insulin secretion attributed to the later stage of T2DM in humans. Swiss albino mice of LACA strain (n=20 males; n=25 females) were given high fat diet (HFD) ad libitum for 3 weeks followed by low dose (40 mgkg-1 body weight, bw daily) of STZ administered intraperitoneally five times from the 22nd day of treatment onwards, in continuation with HFD upto 26th day. Controls (n=15 males; n=15 females) were fed normal balanced diet without the administration of STZ. Successful induction of diabetes mellitus was confirmed by testing for fasting blood glucose, intraperitoneal glucose tolerance and intraperitoneal insulin sensitivity. T2DM mice were administered dipeptidyl peptidase-4 (DPP-4) inhibitor vildagliptin (10mgkg-1 bw daily) and biguanide metformin (50mgkg-1 bw daily) orally for 4 weeks. Control, T2DM, vildagliptin and metformin-treated diabetic mice were evaluated for alterations in lipid profile using blood serum, and histopathology, and oxidative stress parameters using the tissues (heart, kidneys, liver and pancreas) harvested. The experimental design for this study is depicted in Fig. 1. T2DM mice showed significant alterations in lipid profile and tissue histopathology, impaired glucose tolerance, lower insulin sensitivity and elevated lipid peroxidation and protein carbonylation coupled with depressed catalase activity, when compared to age and gender-matched controls. Metformin and vildagliptin ameliorated the abovementioned diabetic conditions. The model displays alterations in carbohydrate and lipid metabolism characteristic of human T2DM, and also exhibits enhanced oxidative stress as well as histological aberrations. Treatment with the anti-diabetic drugs metformin and vildagliptin successfully ameliorated these conditions. Our model differs from previous T2DM murine models in several aspects. Firstly, successful induction of T2DM in both male and female Swiss albino mice of LACA strain were reported in our model, unlike most previous studies which have used only male mice. Secondly, our model depicts various alterations in oxidative stress parameters as well as histological observations in tissues which closely resemble those reported in human T2DM patients. Finally, our study for the first time compares the efficacy of the DPP-4 inhibitor vildagliptin and the biguanide metformin, in ameliorating T2DM in both male and female mice on the basis of the parameters of glucose metabolism, lipid profile and biochemical markers of oxidative stress. Our model is thus stable, inexpensive to develop, mimics the characteristic metabolic features of human T2DM, and is suitable for anti-diabetic drug screening. A murine model of type 2 diabetes mellitus developed using a combination of high fat diet and multiple low doses of streptozotocin treatment mimics the metabolic characteristics of type 2 diabetes mellitus in humans.